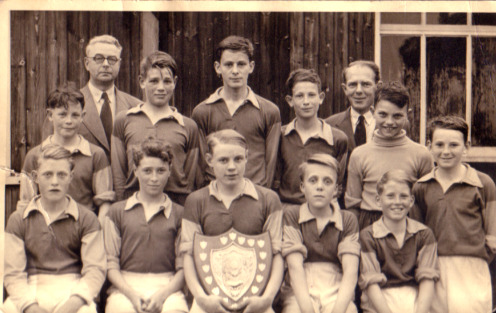 I can name the sports master, Mr. Hunt and headmaster, Mr. Dewey and maybe captain, John Ball. Myself, sat to the right of the captain John Ball. Can anybody name the rest of the team? See below for answers to this question. Thanks to all those who supplied information. This page was added on 27/09/2007. Top left: John Mumby, 2nd, Trev Robinson, ??? ?, we think !!!! 3rd Gordon Reeves, can not remember 4th one !!!!!!!!! Front Row: Connie Taylor, Cyril Plummer, John Ball,Brian Braithwaite, Peter Poole. Back Row: John Mumby, Trevor Robinson,Gordon Reeves, ???? ?, Steve Taylor & Melvyn Claricoates. I managed to contact Steve Taylor’s daughter in Grantham and between the two of us we have I think put names to all but one. A first look at your site, and saw my Brother Gordon, a keen Footballer and Cricketer. He sadly died in Dec 2003 of cancer at the age of 64. He played a lot of club cricket. I would be very pleased to hear from anyone who might remember him In those days he mentioned The Paceys? Also I have a Coronation Coin he won at Cricket?.